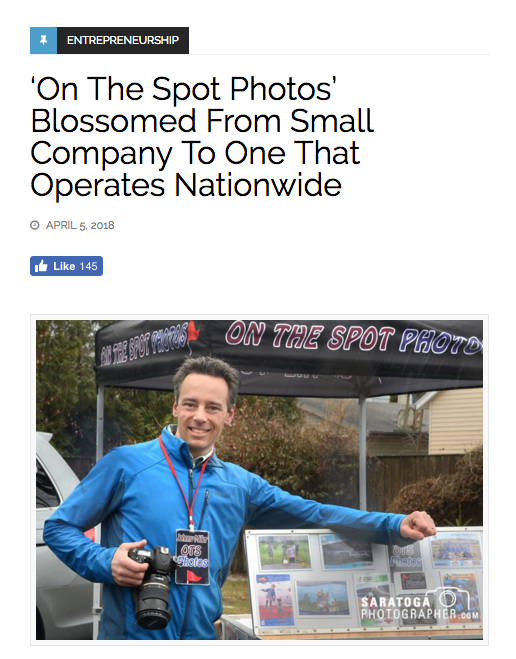 ‘On The Spot Photos’ Blossomed From Small Company To One That Operates Nationwide – Below is an article from the Saratoga Business Journal in Saratoga Springs, NY. By Maureen Werther Photo by Tom Stock of Saratoga Photographer. Johnny Miller’s professional event photography company is called On the Spot Photos for a good reason. Miller’s company, which has been operating since 2009, provides professional photography and printing services for a wide assortment of sporting events across the country, free of charge to the attendees. Anyone who is a skier has had the experience of getting off a chairlift and being approached by a photographer. They take skiers’ photos and give them a retrieval ticket in the hopes that, at the end of the day, the skier will go to the photo booth in the lodge and purchase that photo. Miller, who worked at one point as an event manager at Gore Mountain, understood the pitfalls of the traditional business model. The percentage of people who actually bought those photos at the end of the day was relatively low, compared to the total number of people on the slopes on any given day. “Why not get the event sponsor to pay for the photos and give them away to the event attendees?” he said. Miller has always been involved in sports- and adventure-related businesses. At age 25, he was co-owner of Saratoga Outfitters on Broadway in Saratoga Springs and he coordinated kayaking, hiking and other adventure trips. Between 2002 and 2009, his company, J. Miller Adventure Guide, coordinated trips to destinations for adventurous hikers, bikers and kayakers as far away as Africa. He also worked with New York state, managing the Great Hudson River Paddle event between Albany and New York City. He had difficulty finding photographers to go on these trips to produce photos on-the-spot for the attendees. When the state pulled the plug on sponsoring the Hudson River event, Miller decided to return to school for his MBA degree. It was there that he developed a business model and strategy, and he implemented it to create On the Spot Photos. In all his businesses, Miller’s strategy has been to build the business through demand and spend little to nothing on marketing. Miller’s first client with On the Spot was Impressions of Saratoga. It was Chowderfest 2009. Miller went to owners Marianne and Dave Barker and told them he would get 500 people into their shop, even though they weren’t giving out chowder. 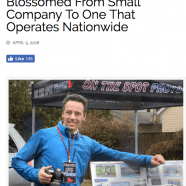 He roamed around town, taking photos of festival attendees and letting them know they could pick up their laminated photos if they went to Impressions. Miller had a computer and printer set up to print and laminate the photos, with Impressions logo. “I had what they wanted in my camera, but they had to come into the store to get it,” said Miller. The strategy was so successful that Miller ran out of paper. After his success at Impressions, other local businesses came on board. In its first year, On the Spot Photos booked seven events. In 2017, they handled more than 100 events across the state and around the country. The photos are given out to attendees as lanyards or magnets with the logo of the event sponsor who paid for the photos. On the Spot Photos works with sponsors for most of the major golf outings in New York. He has also taken his business to Puerto Rico, Chicago, Atlanta, and other major cities. Some of the events he has partnered with include the Jordan Brand Classic in Brooklyn and the McDonald’s All-American basketball game, which draws high school All -Americans from across the country. The maximum number of photos he has produced at one event was 2,200 at the Jordan Classic. On the Spot Photos has also been on hand at major thoroughbred racing venues, including Saratoga and Belmont. Miller said he has a re-booking rate of 90 percent annually, and his business continues to grow through word-of–mouth. In the time since he started On the Spot Photos, Miller has designed and built his own mobile production facility. “I have a 500 square-foot workshop in Saratoga,” he said, which is where he has constructed and refined his mobile facility. For events like the Jordan Classic, he had four computers, six printers and a $700 laminator on hand. He is always working to refine and streamline his system and the unit travels with him to every event he attends. “Saratoga was a great incubator and we really hustled in the beginning to line up sponsors for events. The business really got carried by its own momentum,” said Miller.